Why get a dental cleaning? We recommend getting your teeth cleaned with Dr Jamie every 6 months when you have your dental check up. The health benefits of doing so can extend way behind the obvious, but let’s start there: a scale and clean, scale and polish or dental cleaning- all phrases for the same thing: removal of plaque, bacteria, calculus above and below the gum line and the removal of staining… leaving you with a fresher, whiter, brighter smile. We all know that feeling of leaving the dentist: your tongue and your mouth is going, ‘Wow! So this is what ‘clean’ feels’. It will not only look better and give you fresher breath for those nearest and dearest, but will have significant whole body health benefits. Scientific research shows a link between heart disease, other chronic debilitating medical conditions and gum disease: this correlates to the inflammatory mediators found in the body. The less inflammation, the better; not only a powerful reason to visit the dentist but it should be motivation for spending that bit of extra time brushing and flossing. What is ‘dental teeth’ cleaning? Dental teeth cleaning, or dental prophylaxis aims to remove the hard tartar and calculus that’s impossible to remove with brushing and flossing alone. We also polish the teeth, so bacteria cannot attach so easily to the tooth; we remove stains that build up from those coffees, teas and red wine that you love so much. The bacteria will sadly still colonise the tooth, if you aren’t brushing effectively and the whole process will begin over again. This is why home hygiene is so important and a clean every six months helps to reset the process… leave it longer and the damage starts: the clean will need to be more extensive and is often more sensitive. Actually this is a good question. General rule of thumb is every 6 months. However, those of you who build up plaque very quickly, have gum disease or don’t look after your teeth too well would benefit from every three months, thus preventing further deterioration. Conversely if you have great teeth and excellent oral hygiene… it isn’t going to hurt if you wait a bit longer. Dr Jamie likes to do all his own hygiene work and has a range of tools to remove plaque and tartar: especially useful for those hard-to-reach areas in between the teeth. 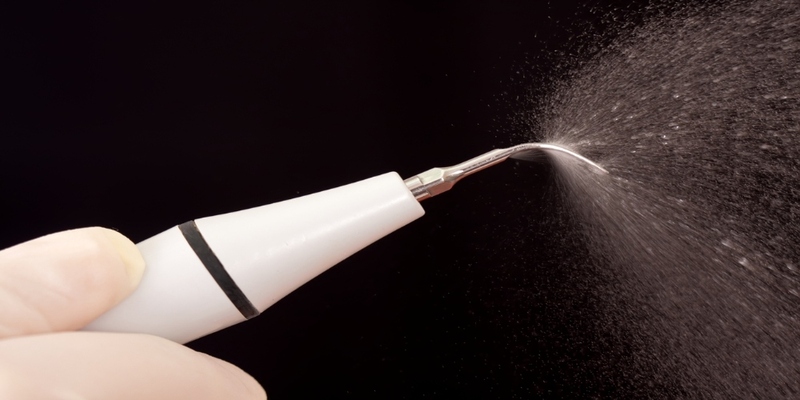 Generally the ultrasonic scaler is his ‘go to choice’ – that’s the high pitched squeaky one which sprays water and can be sensitive, especially if you have exposed roots or recession. He will often supplement this with hand instruments. After they have been cleaned he will polish your teeth with a special dental prophylactic paste, containing both fluoride and a mild abrasive to help with stain removal. If you have a lot of staining, then you may need a fine pumice treatment to remove it, or even the prophy jet – which fires tiny particles to target stain; it’s a bit messy, but very effective especially for smokers. Lastly, Dr Jamie will recommend a fluoride treatment to re-mineralise the enamel, reduce sensitivity and help protect your ‘pearly whites’. For children he will often just phropy the teeth using a soft rubber cup and a special paste, introducing them gently to the ultrasonic scaler. He may use a combination of the scaler and the hand instruments to help remove the harder build-ups. Sometimes teeth cleaning can be sensitive, but Dr Jamie has various ways to ensure that the procedure is not too uncomfortable. He may use more hand instruments than the ultrasonic scaler, similar to a hygienist. Initially, he can place a desensitising paste on all your teeth, just for a few minutes, or adjust the frequency of the scaler tip vibration. In more extreme circumstances he may give you a local anaesthetic or possibly an oral sedative. Tell me about the fluoride treatment? Fluoride is a natural mineral that strengthens and protects our teeth from tooth decay, sensitivity and the many problems caused by wear. It will even help slow progression of problem issues and even reverse decay or cavities in the early stages. Most water is fluoridated in Australia at a low concentration around 1ppm. Research shows this is still a valid way of providing fluoride to the general public. Toothpastes however, are our primary topical source of fluoride, and make a significant difference when massaged into the teeth twice per day for two minutes. The first thing we do if someone is a high risk of decay is increase their intake of fluoride in order to improve their resistance to problem issues. Dr Jamie has an armoury of professional fluoride preparations and fluoride treatments: in the form of varnishes, gels, foams, tablets, drops, mouthwashes and high fluoride toothpastes. Fluoride works best to protect the tooth when it is topically applied to the tooth surface. Am I suited to have fluoride treatments? Everyone can benefit from a fluoride treatment, as its primary function is preventative. Fluoride is particularly important for children, since their developing adult teeth have weaker ‘immature’ enamel. By incorporating fluoride, the teeth become more resistant to cavities and decay. The more dental problems you have, the more important fluoride becomes. It is one of the main factors for reducing your risk of decay, alongside decreasing the frequency of your sugar intake and maintaining good hygiene by both brushing and flossing. A fluoride treatment for the most part consists of simply wearing the special gel in a tray that sits over your teeth for 2 minutes, then not eating, drinking or rinsing for 30 minutes after. What problems should I expect after taking fluoride treatments? It’s a very simple and painless procedure but sometimes patients struggle to tolerate the tray, especially if they have a strong gag reflex or a very small mouth. In these circumstances we prefer to paint the gel on to the teeth. How do I take care of my teeth after dental teeth cleaning and fluoride treatment? Your teeth may feel a little strange at first, as all the build-up has been removed; the tongue is a very curious beast! Teeth can also be a little sensitive, because parts are now exposed that had been hidden under a build up of calculus or tartar. Use a ‘sensitive’ toothpaste for a week and this should settle down nicely. Following a professional cleaning and fluoride treatment, it’s over to you until your next cleaning: it’s time to reset… go back to the basics of brushing, flossing and using the little brushes (Tepes or Pixters) for in-between your teeth. Take on board any advice Dr Jamie has given, particularly regarding your brushing: places you’ve missed, your cleaning technique and especially make sure you’re not brushing too hard. Should you wish, we can book your routine check up in six months time and give you a call a few days before, just to check out if you need to re-schedule, or if the time is still good for you.